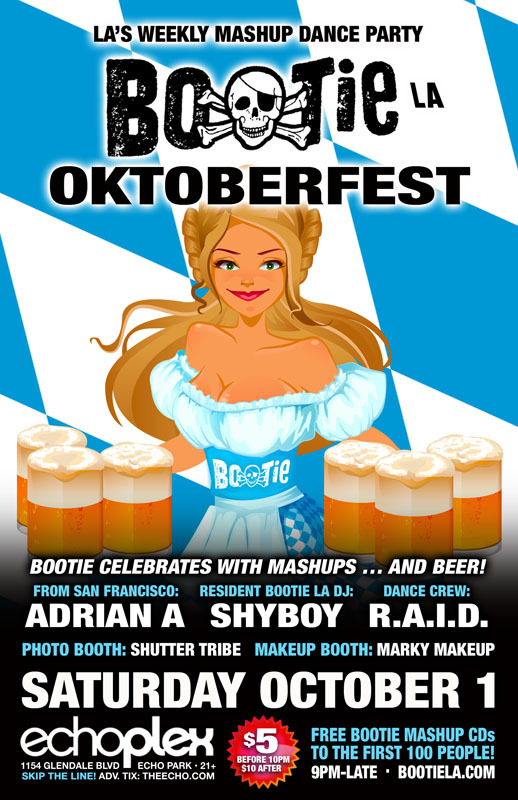 Bootie LA celebrates Oktoberfest with mashups … and beer! Throw on your lederhosen and dirndls and get ready to dance and sing along to mashups all night long! No genre or era is safe! Only $5 before 10 PM! Bootie celebrates with mashups … and beer! It’s Oktoberfest, and Bootie is celebrating the only way it knows how: with plenty of beer and mashups! Bootie co-creator and DJ Adrian A comes down from SF to join LA resident DJ ShyBoy on the decks, as they get you waving your beers in the air (like you just don’t care) and singing along to the best mashups in the universe, keeping your lederhosen and dirndls bouncing late into the night. R.A.I.D. fills the stage with oompah-rific go-go insanity, while Marky Makeup gives your faces and bodies a beerlicious makeover, and Shutter Tribe captures all the fun! All this, plus FREE Bootie mashup CDs for the first 100 people through the door!